What to do with Mom….the “dance” between Mother and Daughter….. 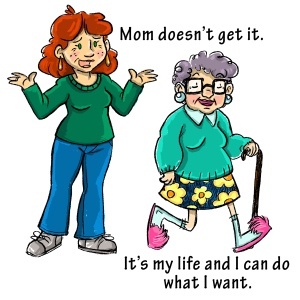 The cartoon characters are modeled after my own mom and sister, Edna and Shirley. Mom was the oldest sister of 13 kids from a dust bowl family that moved to Oregon early in the 20th century. As my mom put it, I had to raise 12 kids before I started my own family. As you can imagine, my mother was used to taking care of others so it was foreign to her to have someone take care of her. My sister , the only girl in a family of five was also used to having her way. This lead to many “dances” about what mom should do. Many of the stories we use in our blog are founded in my world of the little brother growing up and watching this dynamic. As it happened I married the oldest daughter of the oldest daughter of the oldest daughter …..et,al and watched her mother and my wife do the same dance……and now her I have my own company , Griswold Home Care Registry, that places caregivers in homes which allows me to witness this same dance of mother and daughter. Our work of placing caregivers in homes to help “Ednas “of the world gives me a front row seat, witnessing this dance between mother and daughter. Hopefully I can help you “dance better” to have a happier and healthier relationship. We hope by bringing a little humor to the subject we can help your family navigate the journey of aging….hopefully with grace and laughter. Mom, I think we need to talk…. So mom is not as regular as she was? People that can help you……. What To Do With Mom © 2019. All Rights Reserved.